Northamptonshire wrested control of this LV= County Championship Division Two clash with Lancashire after an entertaining third day at Old Trafford which saw 15 wickets fall in the Manchester heat. The home side now face an uphill struggle to save a game which gradually ebbed away from them as both bowlers and fielders tired on a long and stifling afternoon for the league leaders. By the close, the Red Rose still required 395 runs for an unlikely victory having been set 414 runs to win – a fanciful target which would be their record fourth innings total, beating the 404-5 they made in 1910 to beat Hampshire at Southampton. Much of the damage was done in a dreadful morning session for the hosts as their hopes of at least matching Northamptonshire’s impressive first innings total of 438 were dashed after the visitors took the new ball. Inroads were quickly made as first James Faulkner (7) edged Azharullah to second slip before skipper Steven Croft chopped a delivery from Steven Crook onto his stumps for 25. Crook, a former Lancs player, was to enjoy a triumphant return to his old stomping ground, as Croft became the first of his three victims in a spell which saw both Jordan Clark (18) and Tom Bailey (7) also play on to their wickets. When Simon Kerrigan skied an attempted hook shot off Azharullah to Josh Cobb for two, Lancashire had lost their last six wickets for 51 runs and conceded a first innings lead of 130 to their newly upbeat opponents. An early breakthrough for the Red Rose added to the drama of the opening session as Kyle Coetzer mistimed a pull behind to Alex Davies for five to leave Northants 31-1 at the break with a lead of 161. Wickets fell regularly throughout a middle session dominated by 20-year-old Ben Duckett who appeared to be playing a different game from his fellow batsmen as he moved towards his second century of the match. At the other end, Lancashire’s bowlers enjoyed some success for their toil in the heat with Simon Kerrigan bowling skipper Alex Wakely for nine, before Australian James Faulkner found himself on a hat-trick for the second time in the game after dismissing Rob Keogh (20) and Richard Levi (0) LBW in successive deliveries. When Adam Rossington was unlucky to be given out caught at short leg by Steven Croft off the bowling of Aaron Lilley, Lancashire could sniff a slight chance at 110-5 with the lead still under 250. But Duckett soon snuffed out any hope of a Lancashire recovery, as he moved to 88, before inexplicably hitting Lilley straight to Ashwell Prince at mid on when a century seemed inevitable. 113 more runs were added after tea as some lusty blows from Josh Cobb (52*), Crook (37) and Olly Stone (35) combined with some weary fielding from Lancs allowed Northants to declare on 283-9 before the hosts negotiated a tricky period of six overs to finish on 19-0. Northamptonshire skipper Alex Wakely said: “It was a pretty good day for us. “We haven’t always played our best cricket when we’ve come up here so it’s nice to be in a good position in this game. Everything we talked about happened: we wanted to take early wickets and we knew if we got one or two there was always the chance we could get a few more. “The game could have gone either way in the morning and it was a crucial session. If they had got off to a good start they could have been in pole position by the end of the day and so we had to take wickets. We got a couple of lucky ones and the momentum went our way. 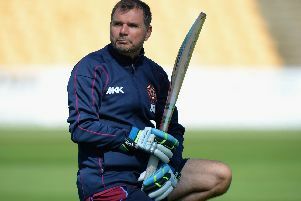 “Ben Duckett batted superbly. He has been superb in this whole game and I think he has been the best batsman in the game, He made it look easy. Ashwell Prince might think differently but it was him who put us in this position with a chanceless innings. “Then we had some good cameos at the end and the day went exactly how we wanted. A few of the players were moaning they had field twice in the day but now we are hoping the weather will hold.